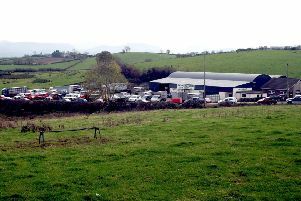 A seasonal entry of cattle on offer at Lisnaskea Sales on Tuesday, March 26 sold to a good steady demand with cows and calves selling to £1,500. Store bullocks selling to £970 for a 520kg Charolais (£186) and selling to a top of £234 per 100kg for a 390kg Charolais to £915. Store heifers sold to £900 for 430kg Charolais (£209) and £895 for a 430kg Charolais (£208). Weanling males sold to £990 for a 440kg Charolais (£225) and £945 for a 380kg Charolais (£248) with smaller ones selling to £312.50 per 100kg for a 160kg Charolais to £500. Weanling heifers sold to £800 for a 320kg Charolais (£250) and £800 for a 370kg Charolais (£216) with smaller ones selling to £266 per 100kg for a 180kg Charolais to £480. Lisnaskea producer 520kg Charolais to £970 (£186), 490kg Charolais to £940 (£192), 390kg Charolais to £915 (£234) and 440kg Charolais to £785. Omagh producer 520kg Friesians to £730 (£140). Newtownbutler producer 430kg Charolais to £900 (£209), Lisnaskea producer 430kg Charolais to £895 (£208), Newtownbutler producer 510kg Charolais to £885. Lisnaskea producer 460kg Charolais to £780. Magheraveely producer 490kg Aberdeen Angus to £750 and 470kg Aberdeen Angus to £670. Derrylin producer 2014 cow and bull calf to £1,500 and 2014 cow and bull calf to £1,100. Belleek producer Aberdeen Angus. Heifer and Belgian Blue heifer calf to £1,205. Newtownbutler producer 440kg Charolais to £990 (£225), Roscor producer 380kg Charolais to £945 (£248), 370kg Charolais to £895 (£242), 410kg Charolais to £880 and 340kg Charolais to £775. Rosslea producer 390kg Charolais to £930 (£238), 350kg Limousin to £820, 330kg Limousin to £800, 370kg Shorthorn to £795 and 370kg Limousin to £780. Belleek producer 370kg Charolais to £910 (£246) and 350kg Charolais to £810 (£231), Maguiresbridge producer 380kg Charolais to £905 (£238), 340kg Limousin to £815, 330kg Limousin to £760, 350kg Charolais to £745, 280kg Charolais to £705 (£252) and 230kg Limousin to £595 (£258), Newtownbutler producer 340kg Limousin to £800, 300kg Charolais to £790 (£263), 340kg Charolais to £785, 290kg Charolais to £740 (£255) and 270kg Charolais to £705. Enniskillen producer 320kg Charolais to £800 (£250) and 330kg Belgian Blue to £785. Kinawley producer 340kg Aberdeen Angus to £785, 390kg Saler to £745 and 290kg Charolais to £665. Lisnaskea producer 380kg Charolais to £780. Newtownbutler producer 320kg Limousin to £745, 330kg Limousin to £745, 330kg Limousin to £730, 290kg Charolais to £655 and 290kg Limousin to £630. Fivemiletown producer 340kg Charolais to £710 and 310kg Limousin to £645. Garrison producer 160kg Charolais to £500 (£312.50). Roscor producer 320kg Charolais to £800 (£250) and 310kg Charolais to £765. Rosslea producer 370kg Charolais to £800 (£216), Newtownbutler producer 390kg Blonde d’Aquitaine to £780. Kinawley producer 330kg Limousin to £760, 380kg Limousin to £750, 340kg Limousin to £690 and 360kg Limousin to £640. Lisnaskea producer 250kg Charolais to £750. Newtownbutler producer 370kg Limousin to £695 and 280kg Limousin to £555. Lisnaskea producer 270kg Charolais to £665 and 270kg Charolais to £635. Boho producer 280kg Charolais to £640 and 260kg Charolais to £565. Derrylin producer 240kg Charolais to £530, 260kg Aberdeen Angus to £500 and 240kg Aberdeen Angus to £500. Garrison producer 180kg Charolais to £480 (£266), Lisnaskea producer 270kg Limousin to £635, 260kg Limousin to £585 and 260kg Aberdeen Angus to £450. More stock required to supply growing demand.